For many, working hours account for a big part of daily life, but unfortunately they can lead to sore feet at the office or workplace. Spending more time on your feet at work can increase the load on your muscles and joints, leading to the development of over-use injuries and musculoskeletal disorders. This usually presents itself as pain and excess fatigue in your feet, knees, legs and lower back. Some label it "normal" or just a part of life, but it doesn’t have to be! Footwear needs to match the demands of work, but should also match the individual biomechanics of both feet and gait. Understanding the needs of one's foot mechanics helps with the selection of footwear that most benefits the wearer. Shoe features such as the forefoot flex point, heel counter support, pitch height and torsional stability each play a role in the overall comfort and support of the shoe. The mechanics of your feet may warrant the need for additional support. This can come in the form of over-the-counter arch supports or custom foot orthotics depending on your needs. Custom foot orthotics can be effective at relieving pain from conditions including plantar fasciitis, shin splints and metatarsalgia (forefoot pain), which all can result from being on one's feet for long hours. Over time, shoes lose the ability to absorb shock as well as they once did when they were new. This means that the feet and joints must instead take on the extra shock that new shoes used to provide. If possible, avoid wearing the same pair of shoes to work each day. 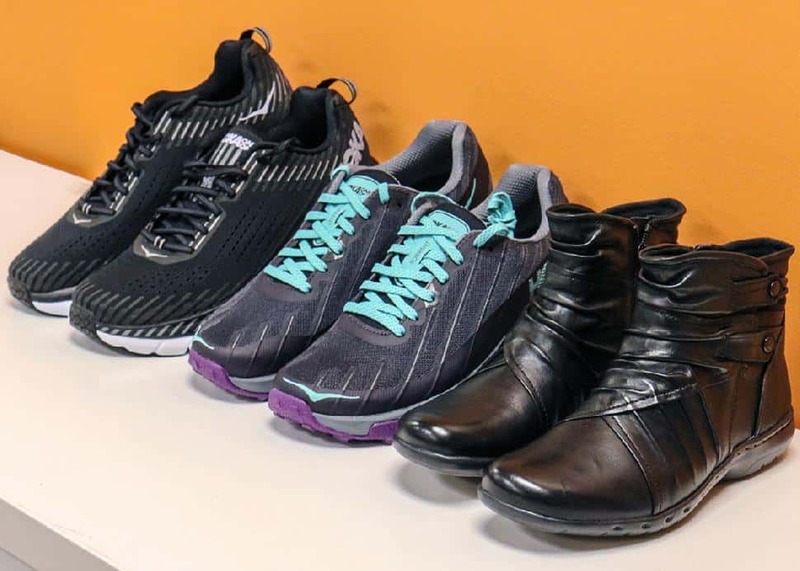 By alternating footwear each day, you lengthen the overall lifespan of shoes and increase the amount of cushioning recovery particularly in the midsole. Throughout the day, use a massage ball to perform foot and leg stretches, which can help reduce fatigue and promote circulation. Simply roll the ball under your feet back and forth along the arches to alleviate tension in the muscles and fascia. You can use your coffee breaks and lunch breaks to stretch your feet and calves. Coming home from work doesn’t mean the day is over (although that would be nice!). Wearing orthotics supports feet throughout your day, but what about at home? Get into a routine of wearing supportive home footwear to allow feet and legs to recover from the workday in a supported position. This will help reduce foot pain caused from over-pronated arches. The longer one suffers from a variety of foot and leg ailments, the more difficult recovery can become. Sore feet and legs aren’t normal in any situation. Utilize the fitting experts or certified pedorthists at Kintec and learn how you can take better care of your feet. You only have two of them, and they need to last a lifetime!